Starting point in Knoxville for the first Volunteer Canoe & Kayak Race. 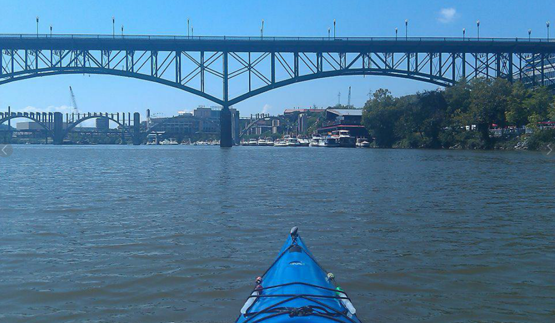 KNOXVILLE -- This weekend, April 28-29, River Sports Outfitters and seasoned kayaker Charles Goodson will team up to host the inaugural Volunteer Canoe and Kayak Race at Riverside Landing Park in Knoxville. Paddlers have their choice of four canoe and kayaking races: 80 mile, 46 mile, 28 mile, or 5 mile. Events are open to all paddle, peddle, and stand-up paddlers alike. "I want to try to keep it an everyman's race," event coordinator Charles Goodson said. "It's more of a challenge to yourself, than who can finish fastest." The key races include the Volunteer 80 Race to the Smokies, which includes an 80-mile route to Chilhowee Dam at the base of the beautiful Smoky Mountains, the Volunteer 46, which finishes at Tellico Dam, the Volunteer 28, a 28-mile route that finishes at the Cove at Concord Park, and the Volunteer 5, a 5-mile beginner course that ends at Marine Park. Start time for the 80-mile, 46-mile, and 28-mile races is 8:00 a.m., and the 5-mile race begins at 10:00 a.m. on Saturday, April 28. Paddlers will have 40 hours to complete the longest course, which will end at midnight on April 29. All racers must attend the mandatory race check-in and safety meeting on Friday, April 27. A complete list of rules for the race series can be found on the event's website at www.appalachiakayak.com. Race course maps can be found at www.lrn.usace.army.mil/opn/TNRiver.